Mast height : 146 feet, (57.48 mts. ), 680 ton. 600 VCA, 3 PH., 60Hz. 4 power conveter module (SCR), with main breaker 1,600 amps. to 9 DC motors 1000 hp: 3 to drawworks and 6 to mus pumps. 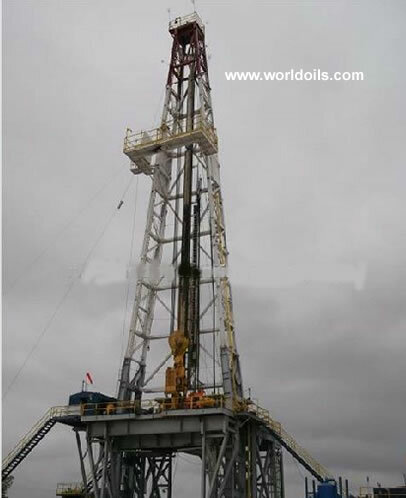 480 VAC, to AC motors to auxiliary loads from rig including lighting system. Drawworks OMIE Hercules E-3000 3000 HP, 612 ton. with 3 DC motors 1,000HP. Crown block PARCO 7-60 760 Ton. Rotary table IDECO 375-E 37-1/2 ", 650 Ton. Power generation CAT D-399 4 Engines 1,300 HP. Mud pumps Gardner Denver (1) PZ.11 3 Triplex pump 1,600 HP.